The Bloodvein passes through pristine boreal forest. 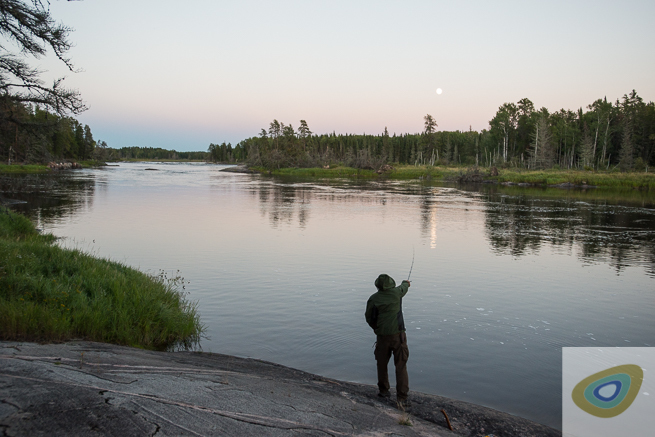 The Frontier Bushcraft Bloodvein River expedition is a two-week voyage through pristine boreal wilderness. 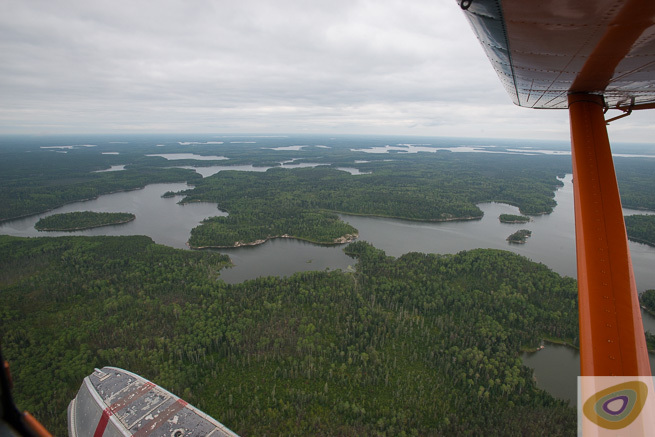 This trip requires insertion by float plane to a remote starting point in the far west of Ontario, Canada. When the float plane takes off and its drone finally subsides as it disappears into the distance, we will be on our own. The silence around us will mark the beginning of a remarkable journey. 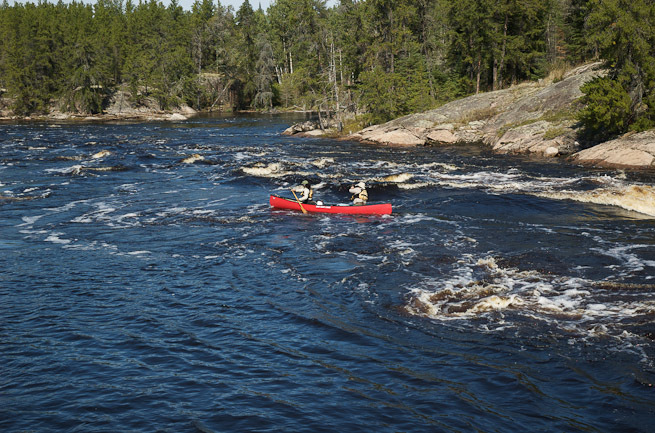 After canoeing to view the fascinating rock art in the area of Artery Lake, we will head west, cross the Ontario-Manitoba border and descend the Bloodvein River towards Lake Winnipeg. Travel into the start of the Bloodvein expedition is by float plane. Photo: Paul Kirtley. 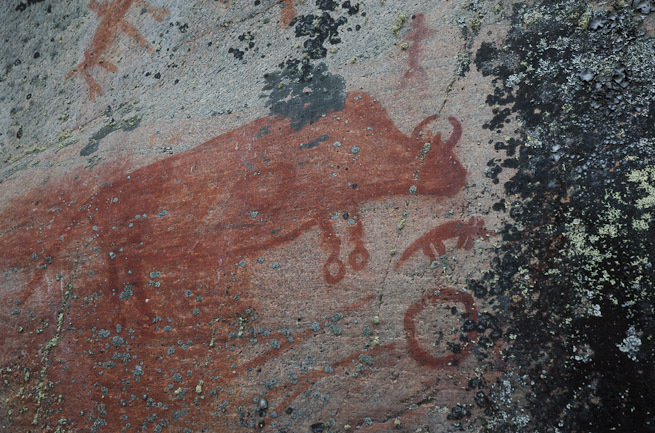 The Bloodvein Bison is part of a highly important rock art site in the Artery Lake area. Photo: Ray Goodwin. 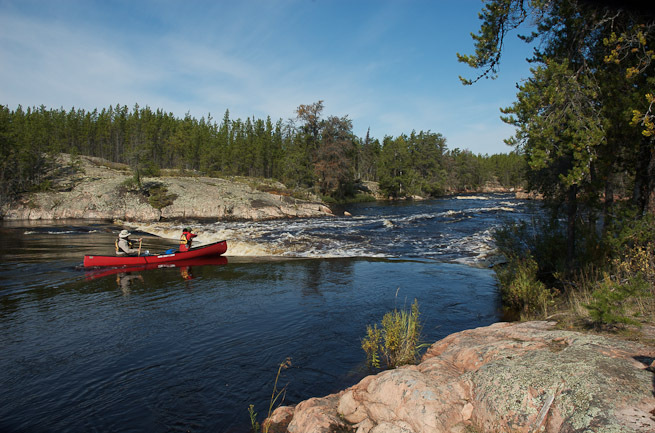 The journey involves paddling a wild and remote route, covering 225km of river with over 100 sets of rapids, all through wonderful boreal wilderness. The Bloodvein follows a wild and remote 225km route through forested wilderness. Photo: Paul Kirtley. 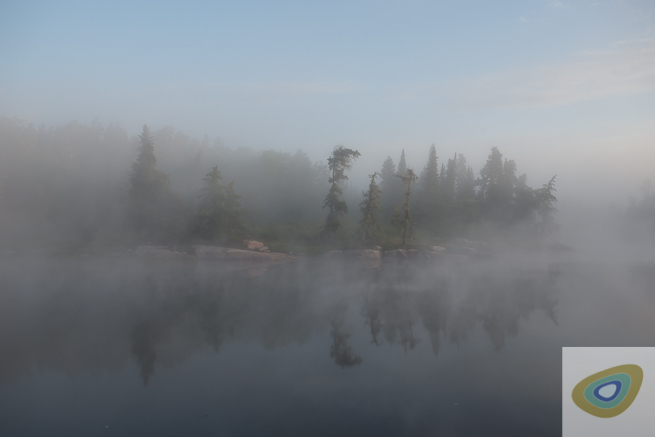 We will make considered use of a combination of careful running, lining, lift-overs and portaging to take us and our canoes safely through this wild land. Lining a canoe on the Bloodvein River. 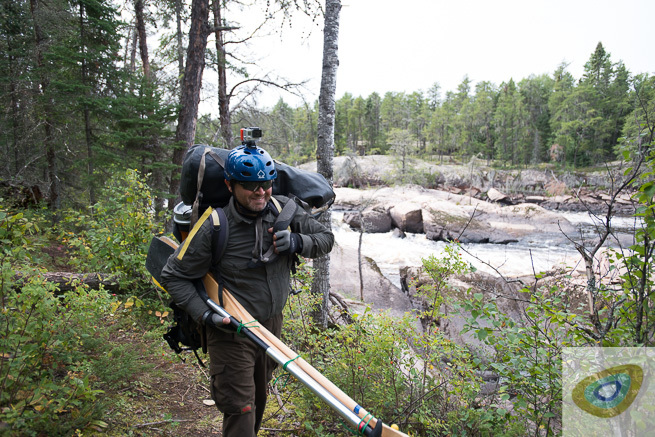 In addition to the full application of a wide range of expedition canoeing techniques, there will be ample opportunity to employ a range of campcraft skills each day. There are also many interesting trees and plants to learn about in the area, the opportunity for good fishing and the potential for some amazing wildlife viewing. This trip is a wilderness journey in every sense. 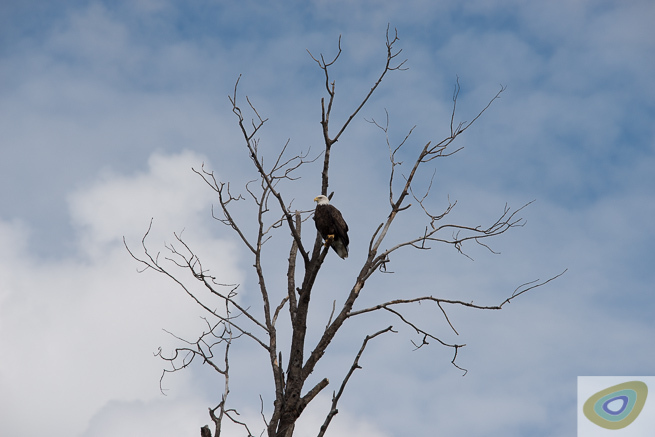 A bald eagle, perched like a sentinel overlooking the Bloodvein river. Photo: Paul Kirtley. 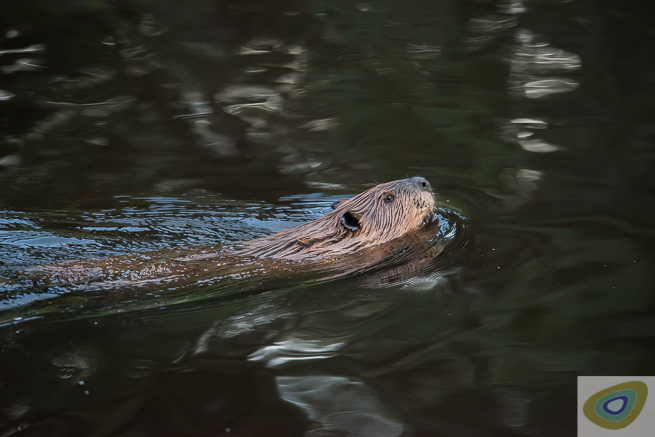 Beaver in a creek feeding the Bloodvein. Photo: Paul Kirtley. During this time you will have the opportunity to employ and hone your canoeing and bushcraft skills under the guidance of legendary canoe coach and guide, Ray Goodwin and renowned wilderness bushcraft instructor, Paul Kirtley. To give us the maximum choice of stunning camping spots while minimising our impact on the environment, to maintain travelling efficiency on the river, not to mention the logistics of flying the group into the wilderness and, of course, to increase our chances of wildlife watching, we have opted for a small group size of eight people in total. Therefore, in addition to your guides, Ray and Paul, there are six places available. Camp life on the Bloodvein. Taking a moment to soak up the view from under the group tarp, before cooking dinner at the end of a days paddling. 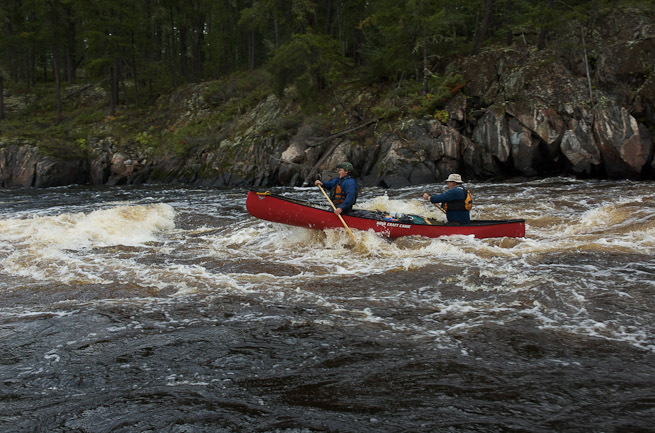 If you have been through our Expedition Canoeing Skills course and undertaken a moving water trip with us such as the River Spey, or if you have undertaken one of our other Canadian trips such as the Missinaibi (or all of the above, as some people have done), then you are well placed to step up to the demands of the Bloodvein. The trip is also suitable for consideration by those who have attained or are working towards British Canoeing 3-star open canoe or equivalent. That said, the BCU system is just a standard measure of experience/capability, not particularly oriented to wilderness travel. It is your experience and capability which are more important than a piece of paper. Hence, we are always happy to discuss your experience. 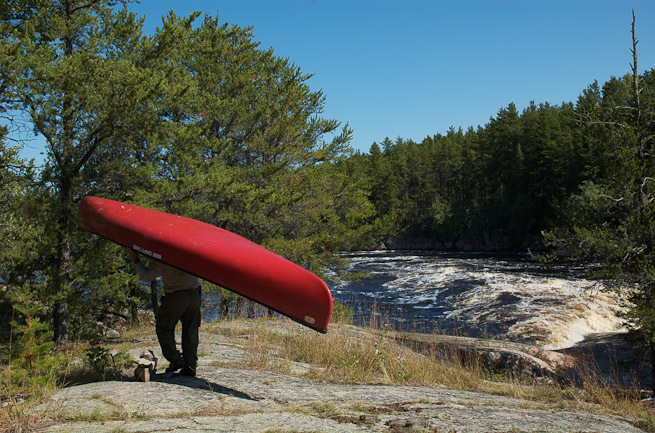 Making a journey such as the Bloodvein will, of course, significantly increase your experience in all aspects of wilderness canoe tripping. 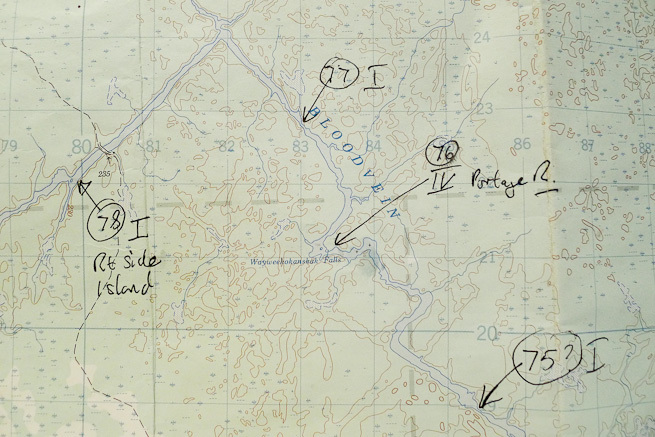 It's worth us pointing out, though, we very much include all members of the trip in decision making processes around how to run the river. You are not just following your guides, undertaking what they have decided. 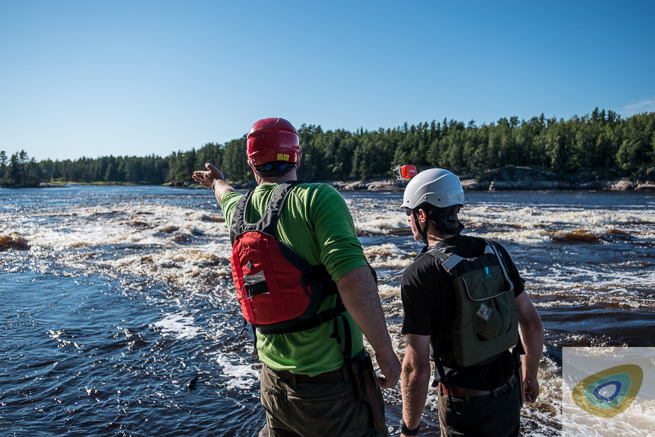 Ray and Paul encourage you to be involved in evaluating rapids and the decisions whether to run, line, lift-over or portage, so you yourself gain experience in the dynamic risk assessment and decision-making that is necessary to negotiate rivers. This is what Ray refers to as mentored practice. It's an immensely valuable benefit of making the journey and is woven into the fabric of how we run this trip. If you want to discuss your suitability further, please pick up the phone or drop us an email. Paul or Ray will be more than happy to chat with you. All our contact details are here. 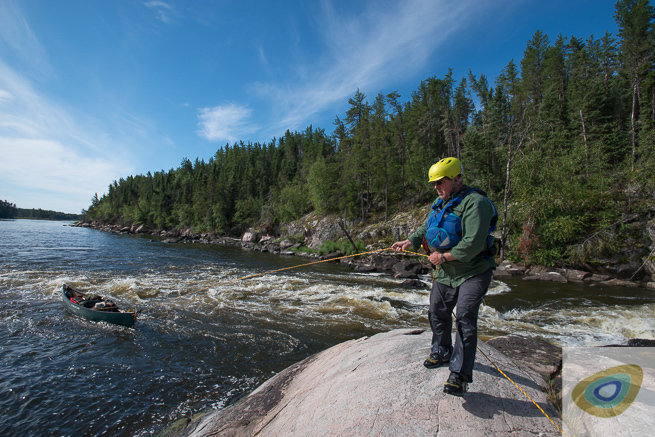 The Bloodvein River expedition is a two-week journey through real wilderness. For dates, pricing and more information on how to reserve one of the 6 places available on the next trip, please click here. 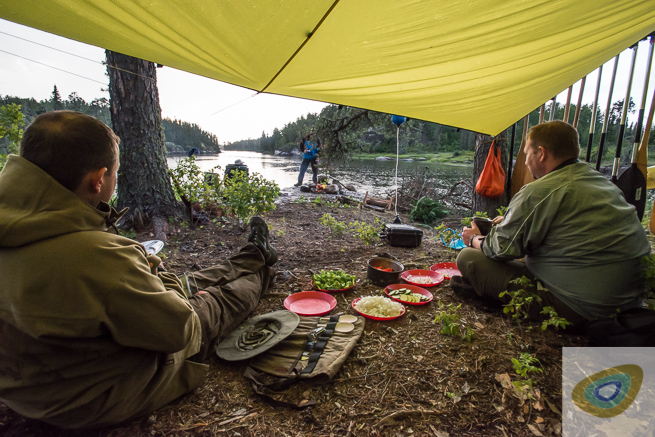 All food, canoeing equipment, ground transfers, float plane flights and accommodation is included. You can obtain a detailed view of what this trip involves by reading Paul's article about the 2014 trip here. You can also explore the region through which the Bloodvein flows via the embedded interactive map here. To reserve your place, please see the following page for more details: Bloodvein River Expedition dates and pricing.